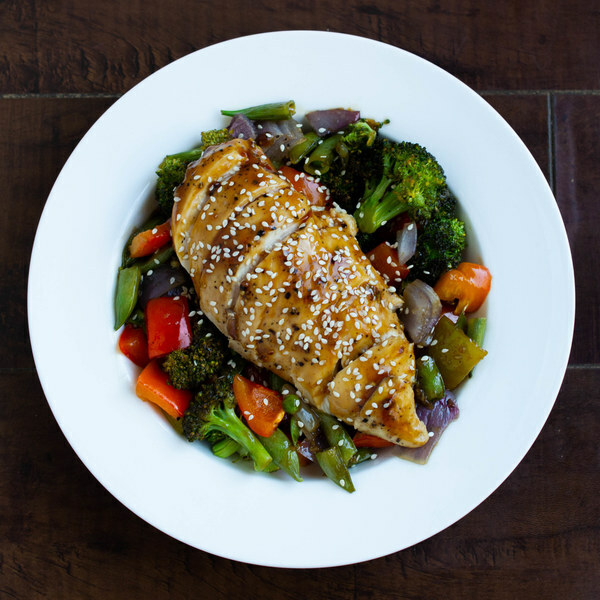 ← Sheet Pan Sticky Sesame Chicken with Roasted Broccoli & Peppers. Pat the chicken breasts dry with paper towels, rub with olive oil, season generously with salt and pepper on both sides and place in the middle of a parchment paper lined baking sheet. Peel and medium dice the onion. Cut the sugar snap peas crosswise (at an angle) into 1-inch pieces and add to a mixing bowl. Cut the bell peppers into quarters lengthwise; remove and discard the seeds and white membranes. Medium dice, add to the bowl with the onion. Separate broccoli into bite-sized florets and cut stems into bite-sized pieces and add to bowl with other vegetables. Drizzle the vegetables with oil and season with salt and pepper; toss to coat, then arrange in a single layer on baking sheet around the chicken breasts. Bake in the oven for 20 minutes. Heat a small saucepan over medium heat. Once the pan is hot, add coconut oil and swirl to coat the bottom. Peel and mince the garlic. Peel and mince or grate the ginger. Add to the saucepan, cook stirring until fragrant, about 30 seconds. Add soy sauce, honey, sesame oil, sesame seeds and water to the saucepan. Bring sauce to a boil, then reduce heat to low, stirring frequently. Combine cornstarch with water in a small bowl and pour into sauce. Let sauce thicken for 2-3 minutes then remove from heat and set aside. Remove chicken from oven, drizzle sauce over top and return to oven for another 5 minutes or until sauce is sticky and chicken is cooked through. To serve, slice chicken into strips. Divide between plates and sprinkle sesame seeds over top. Enjoy!